In UK we call this game Ludo. It has alternative names in other countries. 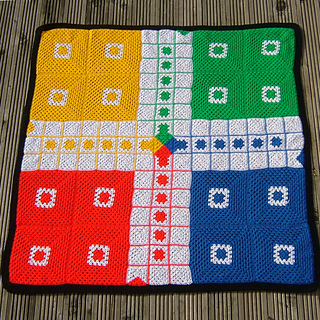 As you might guess Granny’s Ludo is basically made of crochet granny squares. 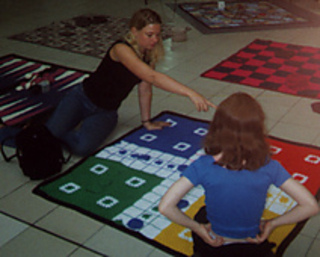 It can be used as an afghan or floor game. 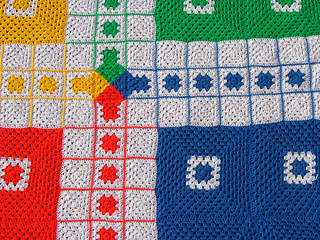 It is one of six Afghan Games. You can see them all here. These games are surprisingly popular with teenagers as well as with young children. 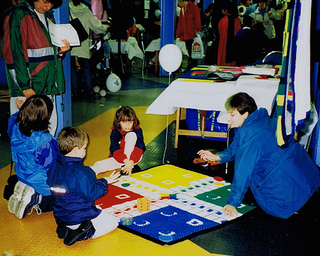 Some of our favourite photos of all time were taken at a Maths Festival in July 2000 when a young girl with very limited mobility and co-ordination spent nearly two hours playing on this game with her father and sister. She loved the game because she could sit on it and it was at a scale she could manage. The bottom photos, of other people, were taken in a shopping centre in Birmingham. 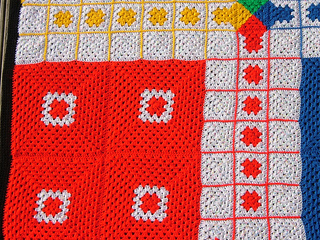 The pattern is available on its own or in Afghan Games. 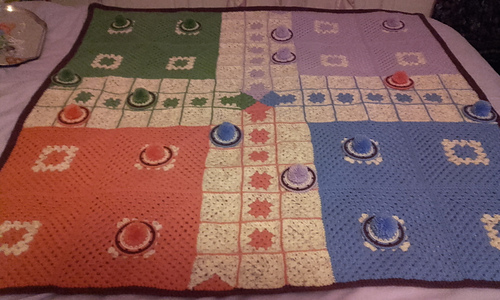 Read the story of this afghan on Ravelry or on Woolly Thoughts web site.